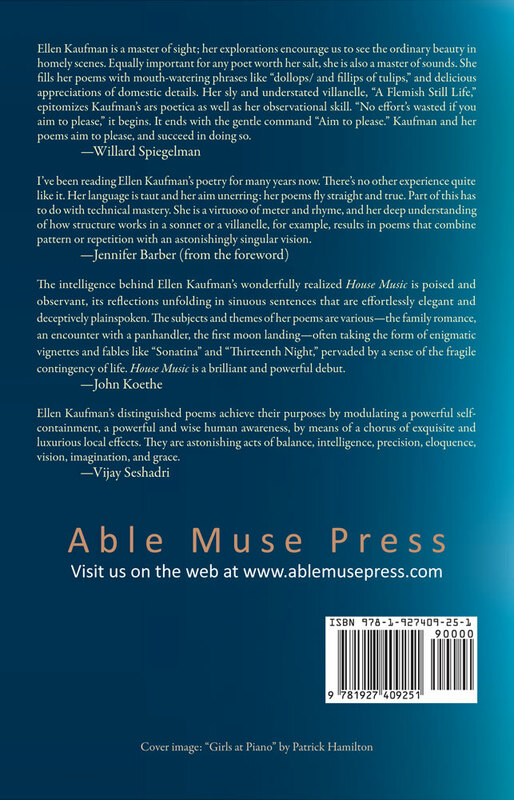 In Ellen Kaufman’s House Music, which was a finalist for the 2012 Able Muse Book Award, the everyday is remade into a luminous tapestry of intricate wordplay, delightful sound effects, and transcendent moments. Her observational skill about the commonplace is revelatory, with fresh insights on such wide-ranging subjects as construction work, native and exotic flora and fauna, a sewing machine and a piano handed down through generations, and a momentous visit to the doctor’s office. House Music is a wonderful debut collection from a uniquely inspired poet. Ellen Kaufman is a master of sight; her explorations encourage us to see the ordinary beauty in homely scenes. Equally important for any poet worth her salt, she is also a master of sounds. She fills her poems with mouth-watering phrases like “dollops/ and fillips of tulips,” and delicious appreciations of domestic details. Her sly and understated villanelle, “A Flemish Still Life,” epitomizes Kaufman’s ars poetica as well as her observational skill. “No effort’s wasted if you aim to please,” it begins. It ends with the gentle command “Aim to please.” Kaufman and her poems aim to please, and succeed in doing so. I’ve been reading Ellen Kaufman’s poetry for many years now. There’s no other experience quite like it. Her language is taut and her aim unerring: her poems fly straight and true. Part of this has to do with technical mastery. She is a virtuoso of meter and rhyme, and her deep understanding of how structure works in a sonnet or a villanelle, for example, results in poems that combine pattern or repetition with an astonishingly singular vision. The intelligence behind Ellen Kaufman’s wonderfully realized House Music is poised and observant, its reflections unfolding in sinuous sentences that are effortlessly elegant and deceptively plainspoken. The subjects and themes of her poems are various—the family romance, an encounter with a panhandler, the first moon landing—often taking the form of enigmatic vignettes and fables like “Sonatina” and “Thirteenth Night,” pervaded by a sense of the fragile contingency of life. House Music is a brilliant and powerful debut. 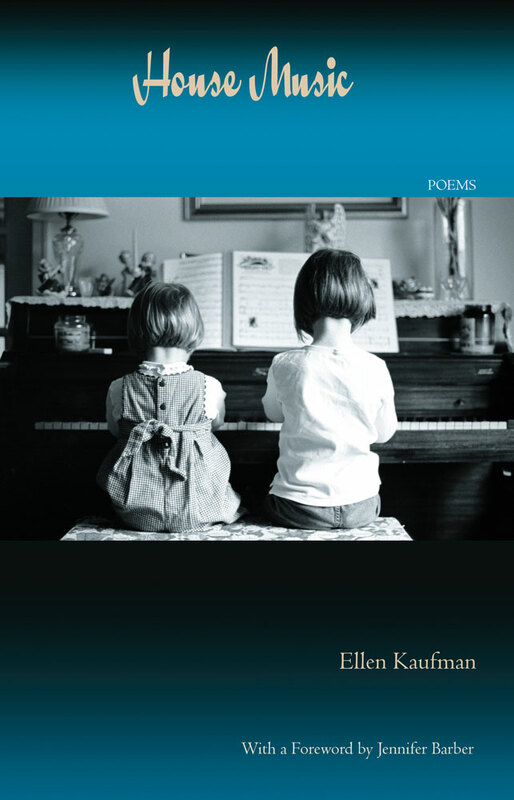 Ellen Kaufman’s distinguished poems achieve their purposes by modulating a powerful self-containment, a powerful and wise human awareness, by means of a chorus of exquisite and luxurious local effects. They are astonishing acts of balance, intelligence, precision, eloquence, vision, imagination, and grace.